The French Are Really Cooking…..
Let’s face it, since Gilles Marini came on the scene who cares about how the French cook food. We do know that some French men, however, are really, really cooking! You know, I would almost give up on waking up beside Dougray Scott when I see this slice of exquisite French flesh. Gilles Marini is hot. More than hot, he is HOT. But, Gilles Marini doesn’t look like he engages in over indulging. Sigh. What is it about me with men who have foreign accents and great lips! Alas, I must turn to the topic at hand–French herbs and spices. There are many different “stocks” made by French cooks. Some of the most well known are: chicken sauce, duck sauce, fish stock, lamb stock, roasted veggetable stock, veal stock, and beef stock. Invariably these sauces have wine in them and are boiled down and ladled over vegetables, meats, fish, and potatoes. French stocks truly were made mainstream by Julia Childs and her wonderful cookbooks. When you really think about it sauces are an economical and ingenious way to flavor foods. I know what you all are thinking. So, you ask, what herbs and spices do the french use when they do use spices? Kinda like, “How much wood does a woodchuck chuck when a woodchuck does chuck wood?” Say those two phrases 6 times really, really fast. Ha! 1. Culinary Lavender. You’ll always find this in the French versions of Herbes De Provence. My spice company, Adult Indulgences Wickedly Delicious Custom Spice Blends, carries a wonderful lavender based Royal Herbs de Provence. You should give it a try. The lavender gives just the hint of bouquet and a touch of bitterness. Ummmmmm. 5. Chervil. Chervil may not be a common herb you have come across before. Chervil is kind of like parsley with a bit of an anise flavor peeking through. Delicious! 8. Cubeb. Cu… what? Cubeb. Cubeb came to Europe via Venetian trade with the Arab countries. It is native to Indonesia. It resembles the cardamom plant and smells a bit like camphor. I find it tastes bitter and like black pepper. 9. Angelica. Angelica has been used throughout the ages as far back as the Nordic tribes to ward of evil and plagues. Pagan’s have used it in their rituals as well. Angelica is a larger plant with large leaves and celery like stalks. It has small flower heads that eventually sport aromatic seeds. Angelica is in the same family as fennel, parsley and chervil. When cooking with Angelica, all the parts of the plant are used: roots, seeds and stems. Whew, for a culture that doesn’t use a lot of spices in their cooking that is some list! 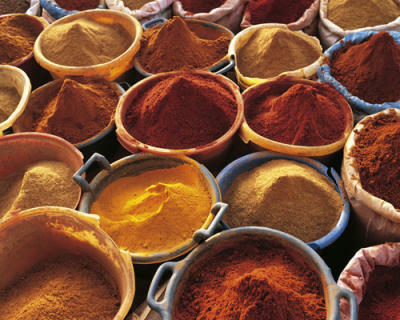 But, it can be deceptive, as the French tend to use “blends” of spices rather than adding individual spices to a recipe. Stay tuned for my next post in which I will list the main French spice blends used to cook French dishes. Now, if you’ll forgive me I’ve got pictures of Dougray Scott and Gilles Marini to view before bedtime. Talk about DELICIOUS! The French spice blend, Herbes de Provence can be found at my etsy store (http://www.adultindulgences.etsy.com) under the Americanized name, Royal Herbs De Provence. I just added my baked chicken recipe using this incredible spice blend. I make my spice blend the way the French do, with actual lavender buds. Incredible! So, see my recipe page and enjoy some baked chicken. Remember, the French are known form more than just french fries! I have to admit that I watched Dougray Scott’s movie, The Truth About Love, again tonight. Had to make my Dougray Scott Cheese Sticks (see recipe page) and break out the Diet Pepsi and just enjoy! Lord, but that man’s lips and voice could melt a ton of butter. He is so galant in this film with Jennifer Love Hewitt that I love it. The perfect knight on a white horse that any woman would love. Dougray Scott has just that right amount of softness and manliness that I adore. But, I’ve read a lot about Scottish men and I would love to get to know him in person. Not that way! Just in a close, friendship way. Really close! 🙂 Well, am off to bed to dream and……………………..ah, Mr. Scott. 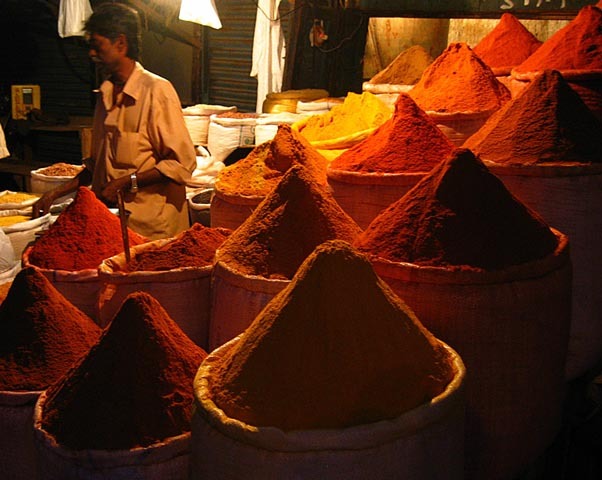 I have always wanted to visit the great spice markets of the world and linger there for as long as I like. Hi all. Am going to make this one short, as I have to hit the sack for a very longggggggggg day tomorrow. I have written below a delicious, yet simple, Greek spice blend. Remember, I believe in powdering all ingredients together in a spice grinder/coffee grinder and storing in glass containers in a dark, cool place. Make sure to put all ingredients in your grinder and blend and grind until a smooth powder if formed. Also remember that powedered spices won’t last as long (3-6 months), so make as much as you can use or share with friends, neighbors and family. There you have it. Simple, elegant and quick to make. Remember store in glass with a tight lid. I will soon be posting a Greek recipe you can try. Or, better yet, you can make up your own recipe and get one from your favorite Greek cookbook. In any case, your food will take you to the Mediterranean. Again, couldn’t resist a fun title. I thought a trip to Greece would be wonderful on our current spice learning journey. In this post lets explore the spices of Greece (which are much like the spices of Turkey). The wonderful climate of Greece has led to an abundance of naturally grown spices and herbs. Some even claim that the essence of Greek meats such a lamb and mutton are made all the better by the animals grazing on the natural flora. It should also be noted that Greeks use a great deal of olive oil in their cooking. A study was conducted to see why Greek men had fewer heart attacks than men in Western cultures. It was found that the average Greek man took in about 6 oz. of olive oil per day. Olive oil is wonderful for heart health and the Greeks are proof. Now, a list of the spices of Greece. It will look a lot like the list of the spices of Turkey, but there may be some surprises for us. 11. Mahlab: Ah, here’s a new one folks. Mahlab is the pit of the sour cherry fruit. It has a nutty, somewhat sweet and sour taste and is used as an additive to cookies and breads. 12. Mastic: What do you know, here is yet another unknown spice to my readers. The Greek Mastic tree produces a gum-like substance that hardens into a resin. The resin drops are called tears and their color is yellow to a very pale green. Mastic isn’t an overpowering spice, but it is a bit piney. It is used a lot in middle eastern cooking and is also said to purify the breath. We fine Mastic used in breads, liqueurs, pastries, ice bream, cakes and puddings. It is often used by mixing it with olive oil, lemon juice and other spices to coat meat before cooking. 35. Purslane: Well, here we go again. Sounds so British, doesn’t it? Well, it’s not. It was first used in India. It is a succulent plant found in open meadows. It is often considered a vegetable and its leaves and stems are used in stews, soups, salads, etc. The flavor is mildly sweet and sour, but it is quite chewy. Well, there you have it. The basic spices and herbs used in Greek cuisine. I know, it is a huge variety, but this accounts for my love of Greek foods. Such depth of flavor, such aroma, such punch. Food of the gods! Hope you have enjoyed this post, as it is a tiny teaser to a fantastic, yet simple, introductory, Greek spice blend that I will be posting in the next several days. Thanks everyone for reading! Please stop by my Etsy Sellers You Must See Page and take a look at the incredible hand-made items done in true old world style. Stunning work by artists practicing in the ways of our ancestors. These various art forms bring back the past as living objects demonstrating the ingenuity of early cultures. I encourage you to visit these sites and see for yourselves the variety and styles of art these artists have to offer. You won’t be disappointed.